Players from Bolton Wanderers visited Bolton College on Thursday 11 April to give its annual RESPECT campaign a boost. Bolton College launched its RESPECT campaign earlier this year, with the aim of engaging students and encouraging them to demonstrate high standards of behaviour in all aspects of their life – with a particular focus on respect for themselves, respect for each other and respect for their community and the College. The campaign has now gained the support of two professional footballers from Bolton Wanderers. As a result of the College’s ongoing partnership with the club, midfielder Darren Pratley and striker Craig Davies gave a talk about how they demonstrate respect, both on and off the pitch, to a selection of learners at the College. 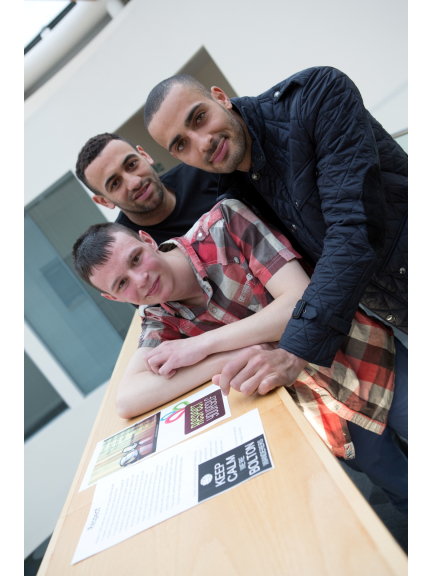 Students at the College have been taking part in the RESPECT campaign since it was launched in March. In addition to tutorials on the topic, the learners have got involved with a range of exciting activities both within College and out in the community. Yesterday, over 25 students took part in the discussion session with Bolton Wanderers players, all of whom are from the Foundation Learning department at the College. Marie Gilluley, Principal of Bolton College, said: “The session was an excellent opportunity for our students to interact with strong role models and discuss how we can all celebrate and demonstrate respect. We pride ourselves on preparing our learners for their future pathways and being work-ready. Our campaign has been running for over a month now and it’s fantastic to see the positive behaviours it highlights demonstrated around the College. Bolton Wanderers players are familiar faces at the Deane Road campus, with a relationship that extends over a number of years. Bolton College’s Football Academy is run in partnership with the club. The College also works in conjunction with Bolton Wanderers to provide BTEC Level 2 and Level 3 sport courses. The students are on the Choices course at Bolton College, which is a preparation pathway to help learners progress onto the next level of vocational learning at College, or go directly into employment. Throughout the year, learners sample a range of vocational subjects, as well as developing their English, maths and IT skills. Learners are encouraged to undertake work experience while on the course, enabling them to develop the practical knowledge, skills and confidence to pursue paid or voluntary employment. For more information about Bolton College, please visit www. boltoncollege.ac.uk.